Jesus calling Peter and Andrew to be "Fishers of Men"
But what does repentance have to do with forsaking our own will and following Christ? Absolutely everything. Jesus’ opening challenge as reported in the Gospels was that people should “repent and believe.” This is a classic example … of a phrase whose meaning has changed over the years. … How are we to unlearn our meanings for such a phrase and to hear it through first-century ears? It helps if we can find another author use it at around the same place and time as Jesus. Consider, for example, the Jewish aristocrat and historian Josephus, who was born a few years after Jesus’ crucifixion and who was sent in AD 66 as a young army commander to sort out some rebel movements in Galilee. His task, as he describes in his autobiography, was to persuade the hot-headed Galileans to stop their mad rush into revolt against Rome and trust him and the other Jerusalem aristocrats to work out a better modus vivendi [way of living]. So when he confronted the rebel leader, he says that he told him to give up his on agenda and to trust him, Josephus, instead. And the word[s] he uses are remarkably familiar to readers of the Gospels: he told the brigand leader to “repent and believe in me,” metanoēsein kai pistos emoi gensesthai. This does not, of course, mean that Josephus was challenging the brigand leader (who, confusingly, was called “Jesus”) to give up sinning and have a religious conversion experience. It has a far more specific and indeed political meaning. 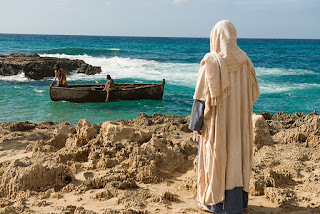 I suggest that when we examine Jesus of Nazareth forty years earlier going around Galilee telling people to repent and believe in him or in the gospel, we dare not screen out these meanings. Even if we end up suggesting that Jesus meant more than Josephus did—that there were indeed religious and theological dimensions to his invitation—we cannot suppose that he meant less. He was telling his hearers to give up their agendas and to trust him for his way of being Israel, his way of bringing the kingdom, his kingdom-agenda. Understood this way, we can understand why Matthew would follow this with the stories of Peter, Andrew, John, and James forsaking their way of life to follow Jesus. They were, in a very real and literal way, repenting. Today, we tend to think of repentance as an effort to overcome sinful behavior. But ultimately, its about forsaking our own wills, and aligning ourselves with God. When understood this way, we can see sin as our own wills and desires which are not in harmony with God. I can’t think of single “sin” (i.e., anything we are taught not to do) that does not somehow fit within this definition. But I think this could also be inclusive of things not typically thought of as “sins,” per se. I won’t list anything off—it is certainly not my business nor my place declare anything a “sin,” and I am sure you are perfectly capable of thinking up relevant examples yourself, anyway. But this understanding makes essentially anything that gets in the way of us submitting to God’s will a sin. Perhaps it might be productive for us all—myself included—to personally consider and evaluate our own behaviors, actions, thoughts, and so forth, and consider what might be getting in the way of aligning our wills with God’s will. And then strive to make those necessary changes. Anyway, I hope this understanding of repentance can in some way be useful and insightful for not only your study of Matthew 4, but the Gospels—and the gospel—as a whole. N.T. Wright, The Challenge of Jesus: Rediscovering Who Jesus Was and Is (Downers Grove, IL: InterVarsity Press, 1999), 43–44.